126,000 people around the world have viewed the film online so far, and up to 1,000 people watched on the night in cinemas across Europe. The film broke new ground in artistic and technical ambition. 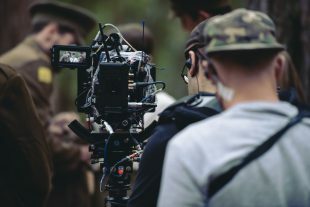 Taking on the challenge of shooting a feature film in one continuous shot, we live streamed from a mobile camera moving across four kilometres of rough terrain. And audiences in cinemas and online interacted in real time, sending messages to the narrator that became part of the film. Part of 14-18 NOW, the UK’s arts programme for the First World War centenary, Bloodyminded was inspired by research into World War One conscientious objectors carried out at the Imperial War Museum, London, Militärhistorisches Museum der Bundeswehr, Dresden, Bundesarchiv, Berlin, Bibliothèque nationale de France. And British Army veterans generously shared their experiences of training, frontline combat, banter, bullying and Post Traumatic Stress Disorder in a series of in depth interviews. Like so many of Blast Theory’s works, Bloodyminded was a tremendous leap of faith. 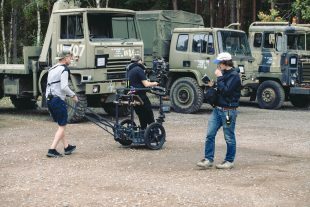 More than two years in the making, the project culminated with a crew of over sixty five working from a military camp in Hampshire. 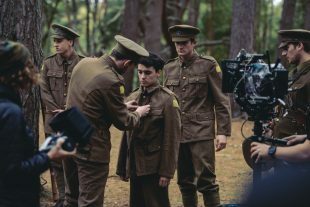 The script drew on in-depth research and one to one interviews with soldiers with front line experience; followed by months of preparation, recces, casting and rehearsals. 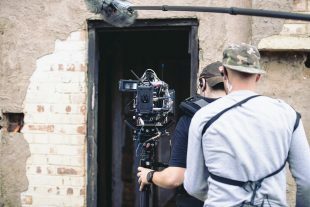 Our work is all about taking creative risks to find new ways of inviting audience to have powerful, live experiences where their own voice matters. We are driven by the adventure of finding new forms of interactivity to invite audiences inside our work. Our work is an exchange of ideas, between ourselves and our audiences. Our work never stands still and we believe in taking risks. We have been overwhelmed with the sheer number of positive and supportive messages from people who watched the film online and in cinemas. With thousands of people taking to Twitter and Facebook to tell us how much they enjoyed the thrill of the experience. We will be sharing what we have learnt in the near future. We have also heard loud and clear that audiences are willing to sidestep technical glitches in favour of work that is innovative, risk taking and that has an important message about our society at its core. We’d like to thank everyone – our collaborators, our supporters and our audiences – for taking that leap of faith with us. 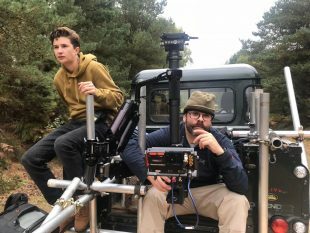 We will be holding a one-off screening of the film, followed by a Q&A with Director Matt Adams, at Attenborough Centre for the Creative Arts, on November 29 at 7pm. Booking details to follow shortly. 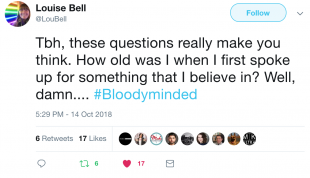 Visit Bloodyminded.org to learn more about the work. 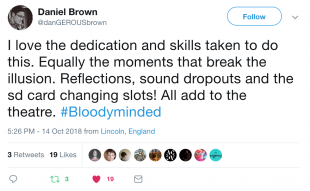 Bloodyminded is a new work by Blast Theory, co-commissioned by 14-18 NOW: WW1 Centenary Art Commissions and by Attenborough Centre for the Creative Arts. Presented online by Boiler Room 4:3 as Digital Presenting Partners. Bloodyminded has been created with the support of the Europe for Citizens Programme of the European Union, The Space and Polden-Puckham. Media Partner, Pathfinder International.